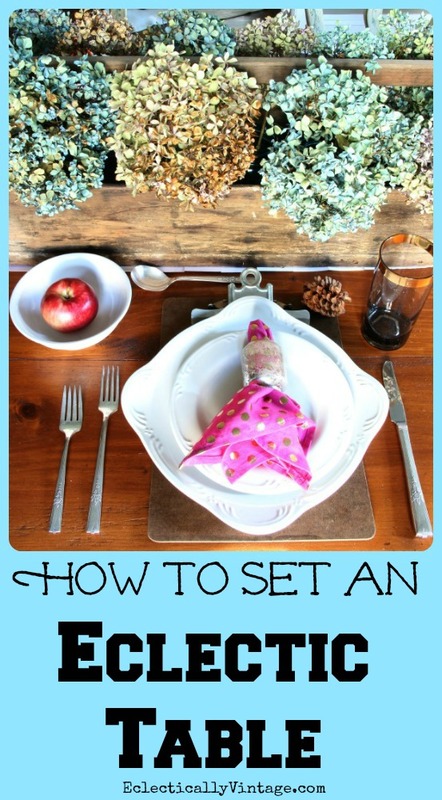 Fall Table Decorations and a Giveaway! 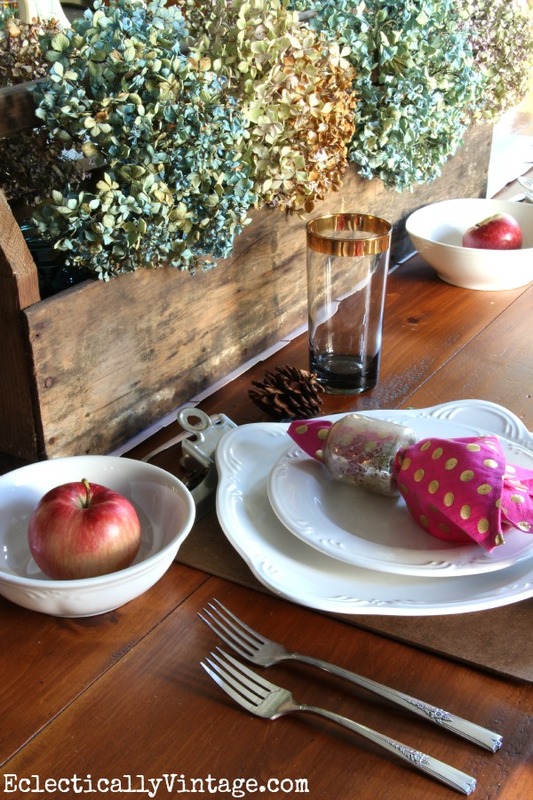 My Fall Table and a Giveaway! I didn’t put fine china on my bridal registry. I’m not a formal china kind of gal. oh and I’m still shocked over poor Matthew’s untimely demise in that car accident. That’s why I love white plates. They really make the food the star and they are perfect for mixing in fun finds like my vintage silverware, mid century glasses and vibrant mismatched napkins. Thanksgiving, Christmas, family dinners, potlucks … they can be used for any occasion and are always in style. So when I spotted these Pfaltzgraff dishes, I knew they had my name written all over them. Bonus – they come in both Pfaltzgraff Filigree Round which can be found at Kohl’s and Pfaltzgraff Filigree square that’s available online – perfect for my mixing and matching ways. the other half gets the reverse with square dinner plates on the bottom. Everything sits atop vintage clipboards. don’t have vintage – just use a few different sets of new. my dining room table was covered in pitchers of water brimming with flowers. Now they make the perfect centerpiece. 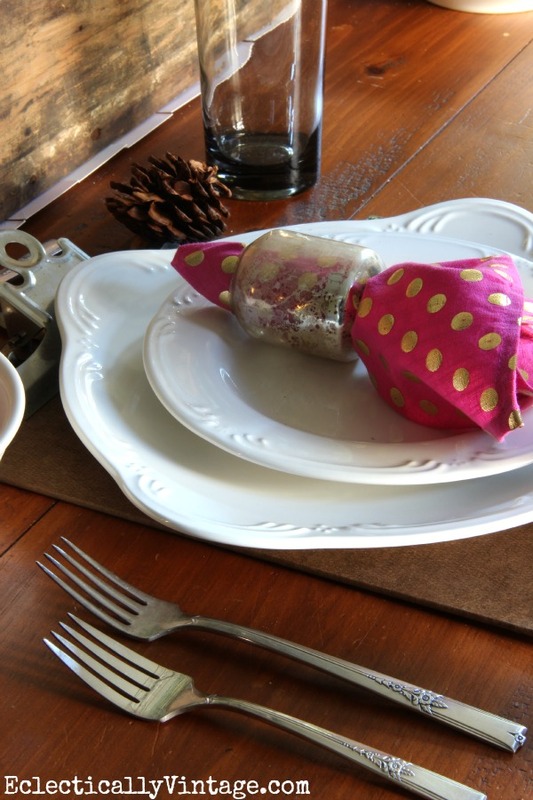 Here’s to showing off your eclectic style at the dinner table. Disclaimer: Thanks Pfaltzgraff for sending me this fabulous dinnerware but I only speak the truth. I love white dishes. They make a table look so fresh and new. I love the white on white look and am a sucker for a square plate! The square are so fun! I love white dishes! Can add different printed plates to constantly change the look of your table without spending a fortune! I love square plates and really need the neutral white! I love the square, and I love white. I love white dishes but still don’t have any. Keep saying I’m going to buy some……maybe I should head to Kohls. Love the round and square. Thanks for the chance to win a set! I currently have the older Pfaltzgraff pattern Heritage. I love the square now! 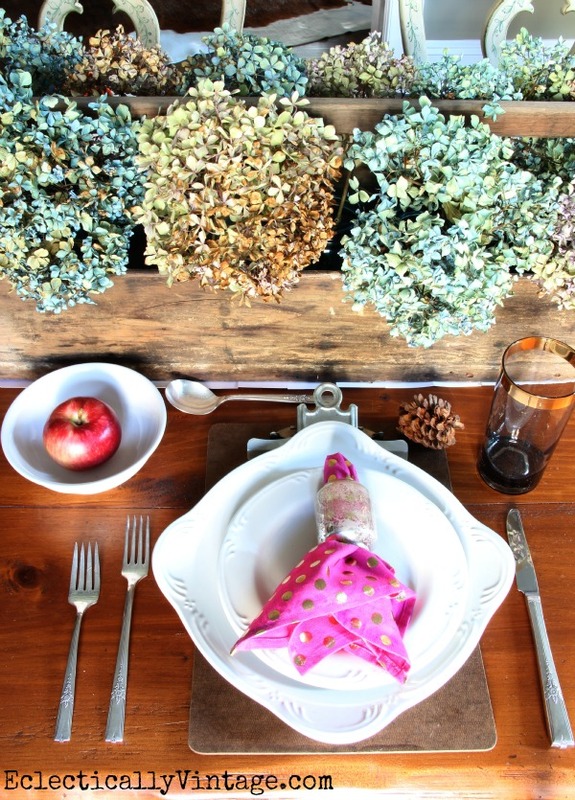 Your table looks fabulous…love those hydrangeas! I love the look of the round filigree on top of the square – I would have to get BOTH! Beautiful table! I love white dishes! They go with everything! White dishes are always so pretty. I really like both. who just got her first place. I love white dishes! And Pfaltzgraff is near and dear to my heart because that is what my mom always had when I was growing up! They last forever. I do have one question, where did you find your napkins? I am a huge napkin girl and I love these! 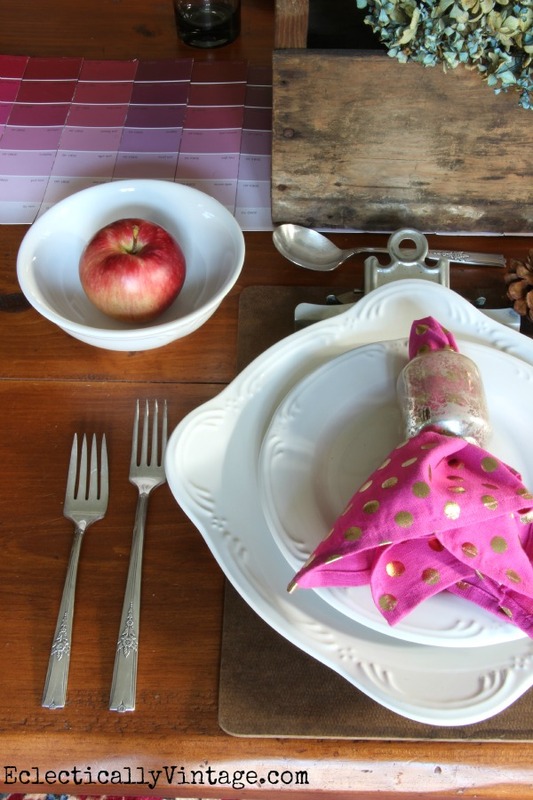 The fabulous napkins are from the clearance bin at Anthropologie! I love the dishes, but I really love the hydrangeas. I have some drying right now, following your directions. Love the all white! I didnt register for dishes either – these are gorgeous! Loving the round plates although I’d do what you have and mix and match them, they’re gorgeous. Awesome table! Love the paint swatch table runner…You didn’t mention it. Did you just lay them next to each other or connect them some way? I L-O-V-E the square plates! And i too am a sucker for white plates. I have a dark wood table top with a white bottom, and i love white plates on my table! I love the entire look but if I HAVE to choose, then I pick the square plates. Your table looks AMAZING! 🙂 I am keeping my fingers crossed that I win this giveaway…I need dishes sooooo bad! Mine are chipped and have missing pieces….it is time for new dishes & I LOVE Pfaltzgraff dishes! you are a table setting rockstar! I love the unusual shape of these dishes! Something different. Plus, I’ve never had white dishes. Seems like you can do a lot with them! I currently have round white china, so the square would be a great addition! LOVE the white on white dishes and the square plates are just beautiful. They make such a statement on the table. I think the square plates would look great on my table. Kelly, your table is gorgeous. Love the apple in the bowl, the clip board charger idea, and your dishes are beautiful! l Love the square ones but if I had to choose a set for my table, I would have the round set. I am traditional girl. The white Pfaltzgraff dishes are so gorgeous! I’d be thrilled to set my Holiday table with them. BEAUTIFUL! Love the square and round together…would choose round if I win and buy me a set of square! I love the square ones – they can easily mix with other round ones of which i have many! 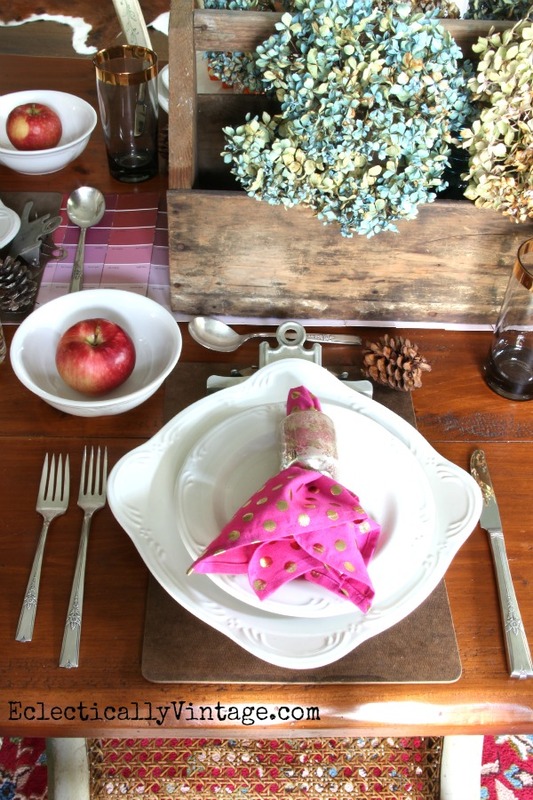 I’ve always liked white dishes as you can use colorful tablecloths. Plus I’m in love with square dishes! I found the napkin rings at a thrift store – 8 for $2! They still had the Pottery Barn stickers on them! I’ve been looking for white everyday dishes and this just might be the “one”. I have owned Pfaltzgraff before and loved them. Cute setting, and really like how you used the square with the round! These go well with vintage accessories too! Love it! Love the white dinner ware…wish I had thought about getting white 36 years ago….oh well just have to make do with what I have unless of course I win these! Kelly, I’ve been married nearly 30 years and have used the same dishes that I had purchased for my hope chest before I even met my husband. It’s time for something new ! Especially since some of my original set no longer exist, thanks to a hubby who isn’t very careful. I really like the square design. Thank you for hosting this fantastic giveaway! Love the square, but love the combination more! 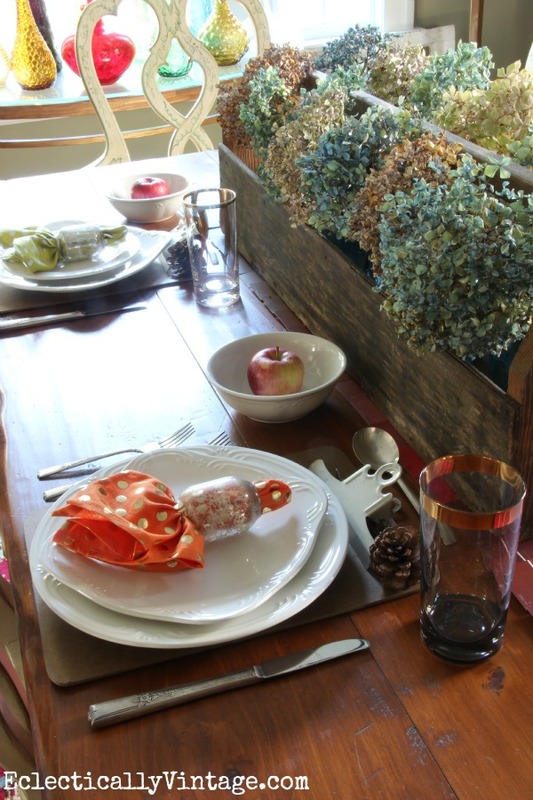 Your fall table display is So Fun!! I like the round plates better…I guess I’m a tad traditional. I have a plate wall with vintage white ironstone…it’s classic and beautiful, and I love it! I prefer the round filigree setting. Classic. I prefer the round. So pretty! I prefer white dishes myself and I’m not a fine china kind of gal either. I love white dinner ware. There is just so many possibilities when white is the base and it makes a beautiful table either formal or casual. I love them both and would love to be able to add them to the ones I already have! Very creative table setting and I like the square dishes. I enjoy all your tips on your blog. My daughter has the Pfaltzgraff Filigree round style for her everyday dishes. They are easy to dress up for a more formal look. I like how the square and round look together on your table. i love the white dishes, it took me a few years to figure it out, but i finally did!! I love white dishes they can be used for every holiday just change accessories. I like the round ones! I love square dishes and these are georgous! Definitely the square plates. I wanted square everyday plates when I got married (43 years ago), but everyone said they were too “out there”. I like the round dishes. This is such a pretty pattern! They are both lovely, but I like the square the best! I really like the square dishes! I love how it adds a different shape to the table. you have no idea how much I need these dishes. we just noticed yet another crack in our remaining 5 dishes…so now we are down to 4 that match, and 4 that don’t. ugh! these round ones would work with the white round set I have. I love round just because it would give me something different. I have a set of square plates now and I absolutely love them! I have enough china to start a store. And the winegalsses I registered for (Mikasa, circa 1983) are pink. So what I really could use are some new wine glasses. I adore the square- it’s lovely. I love the square dishes. I have 4 different sets of white plates but none of them are square. The square plates would be so much fun to mix and match. Thanks for the opportunity to enter to win these wonderful dishes. I love the white dishes, so pretty and versatile! They look even better the way you mix and matched the square and round sets. Oh the clipboards… once again something so simple used in an unexpected way for fantastic results! Thanks for sharing this design and opportunity to win! Both are beautiful! The round plates, though, would be the most versatile for me. Your tablescape is lovely! I am all for white dishes, too…the food looks beautiful and every color goes with them! I love these dishes…the square is fun! What a beautiful table, from the white dishes to the hydrangeas and fantastic clipboards as chargers. Love it all! I have a set of white Pfaltzgraff dishes that I use every day…they are over 20 years old and still going strong…Love your table Kelly!! !…the clipboards are a great use for a placemat…love it..you are so creative! 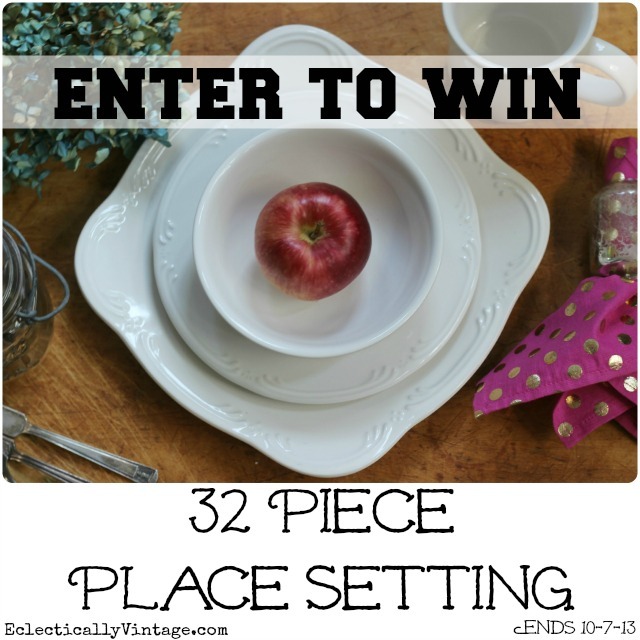 Just love those square Filigree dishes…great giveaway! I’m in love with the square dishes!! Unfortunately, the white dishes I currently have are very plain and round. Love the round and square together. I would love to get these…it would be great to be able to use them for any occasion…by adding themed napkins. I love white and do prefer the round filigree. Luv how you mixed the round and square settings, but I’d have to go with the square ones for myself. I love the contrast of the square vs. the round plates! I love the way you have them on your table. If I had to pick I would be traditional and go with round. I love simple and I love white plates. I have square ones now and I love them, so I think I like the square ones. Lovely, Just amazing. I agree about the while plates. I would love to win some. I also am so so sad about Matthews death on Downton. That really threw us here lol. Lets see what next season shall hold! I can’t wait. I forgot to add I love the Square plates! I LOVE the elegant simplicity of these dishes. And the square was are gorgeous! These would go with any decor. Just lovely. Thank you for the chance to win! I love the square plates. Thank you for this giveaway. I enjoy your site!! Love the square plates. Thank you for the chance to win a set! Thank you for the giveaway. Always enjoy your ideas. I love the square ones! I think I like the round best. Kelly I love the dishes and will enter this giveaway for sure. That centerpiece with the hydrangeas is just gorgeous!! Forgot to mention I love the round. I’ve been thinking about a set of white/neutral dishes to mix and match with my colorful ones and I love the square shape of the larger plate! Your table is just beautiful! I’m so in love with the old clipboards! Wonderful idea. I’m going to pass that one around to all my fellow teachers. Pfalzgraff has always been part of our family. My Mom buys us a piece every year for Christmas. Each of us girls has a different pattern. Honestly I thought having a “formal” set of dishes was a waist. But ours our very casual and…I love to see what she’s going to give us. Could be anything from gravy boats to glasses! Thank you for such a fun giveaway! I like the round. thanks for the chance to win! i am a classic round gal! I Love white dishes, and the round ones are beautiful!!!! I love the square plates!!! I love the white dishes. I’ve been using white dishes since I got married way back in 1991. They really do go with everything! My favorite is the square, however, I love the square and round together. All are very pretty and I also love those napkins. Love the square dishes. I do have china…but now I wish it was solid white. But I didn’t know that 40 years ago!! I have white dishes too but I like these better! I got mine at the thrift store – a set of 16 place settings for $10.00. I don’t know the pattern name but it has a fruit design. I like the round filigree. We love square plates! They are both lovely, though. Like most of the readers, I love both, but… if I had to pick one it would be the square. Maybe because it just fits my personality. Great giveaway! I love the round! My choice would be the square plates. Thanks so much for this great giveaway! Kelly … you just can’t go wrong with white dishes … makes all the colors pot. Love the shapes and your table looks lovely. I like both but I think my fave is the square. They are both lovely – especially how you put them together. If I am forced to choose I prefer the round. Both, but favorite is round. So so so……….excited to see your tool carrier with hydrangeas in it!! I got this super one from a high school sale. I don’t know if it was from shop class or the janitor actually used it but it has “West” painted on the side and it was West High School………I am totally going to put flowers in it and put it on my dining room table!! Would love to win these dishes. Love the idea of the white and you can mix and accessorize with anything!!!!!!!! This would be so cute with my inherited milk glass teacups and plates!! I have to say, I prefer the square plate. I like the square plates. I love white dishes and would love to win a set for my daughter who is getting married November 30th. I’ve never used square plates but would love to add some to my collection! I love the square shape and the white color looks wonderful! I adore the white place settings. I inherited china that is blue. It does not go with Thanksgiving nor Christmas theme table decorations. The white would go with anything! I really love the square plates! Mixing the shapes keeps that setting fresh. I’ve always wanted white dinnerware but they seem to find themselves at the bottom of the spending list. Love this post. Got the hydrangeas drying now! Square! 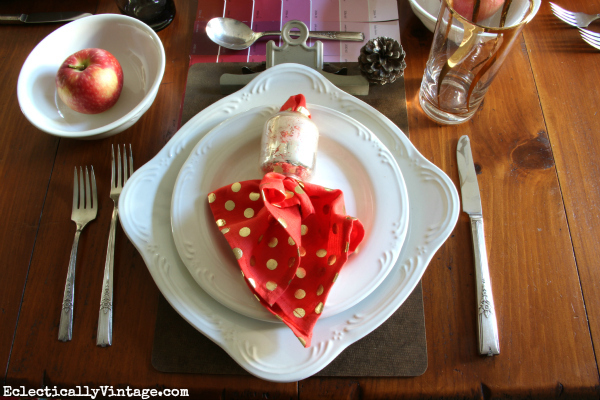 I love white plates because they make my vintage fiesta ware pop! Your setting is So inviting! I really love a square plate! What a gorgeous table! Everything about it speaks to me. 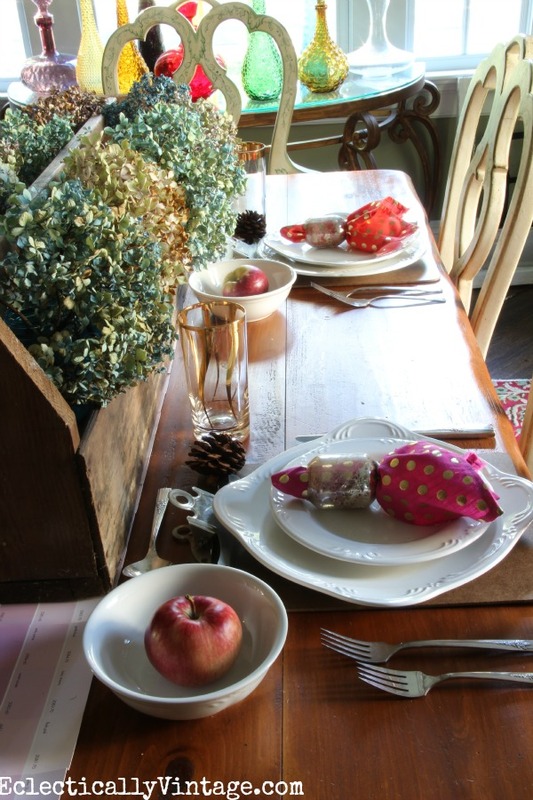 The chairs, the dried hydrangeas, the white place setting and all the warm wood. Just lovely. I do love my white Pfaltzgraff dishes for the same reasons, casual, homey and not to be worried about. And yes, I also pair mine with fine crystal and silver on occasion and it looks fabulous! LOVE these dishes! Currently in great need of something to replace my Corelle. You set a mighty fine table. I’m a sucker for accent plates; love your mix-and-match look. And that paint swatch runner; so clever. How did you ever make it out of the home improvement store with that stash? I love the square mix and match plates. I love the bright colors…I wouldn’t think to add those but it brings a pot of unexpected color!!! I agree Kelly, this pattern is so you!!!! Hope I win one too! BTW, Congratulations on getting into the Color chellenge on AT, I voted already!!! !Good luck dear! LOVE your table. I think the square would be something different for me. like the square…adds a different look. Any decorator worth his/her salt will tell you that a set of white dishes is one of the most versatile items you can have in your china cabinet- can be mixed and matched with any accent color, and are perfect for any special holiday table setting! These are especially beautiful, and I love how you have mixed the square with the round! (If I could only have one, I’d have to choose the square.) And clipboards as chargers! Who knew! My daughter is a teacher… I’ll be “borrowing” that idea, if you don’t mind! Beautiful table! you’re right about food taking center stage with white dishes. i like round…not so adventurous! I love the square dishes! I love the square set because it’s so unique! Thank you for sharing your talents! I”m ready to decorate my house this fall, and love these eclectic designs. Love the white dishes and hydrangea centerpiece! Well they’re both lovely. I guess I prefer the round ones for handling purposes. It’s easier to chip square dishes. I love the difference the square ones make! Oh!! Pick me! Pick me! Mama needs some new dishes! Hi Kelly, I have always loved white plates and these are beautiful. The shapes are wonderful! We are in desperate need of a new set of dishes. After almost 8 years of marriage our set is finally starting to fall apart. I’ve been wanting to but a plain white set since its timeless so this giveaway is perfect. Thanks so much. I’ve always wanted a set of square dishes but couldn’t justify the extra expense in my budget. These are just beautiful. How fun it would be to mix and match. They’re perfect! The square dishes are nice – and your table decorations are beautiful! Love the square! Your table is beautiful! The square is lovely, slightly unorthodox, while the pattern and color remain traditional. Love white dishes overall,I think I would pick round. Love the all white dishes, they really do make food ‘pop’. I would choose the square dishes if I had to pick one. This plates are just my kind of style. I love them both and I already have some white everyday stoneware dishes that they would mix in so nicely with. I do love you hydrangea arrangement. Doesn’t everything look better with hydrangeas? The place settings was so cute the clip board was a cute touch but how neat of to use paint chip card(not sure what they are called) under your silverware. A great giveaway and a very nice post. Thanks for sharing your ideas with us all. I really like the looks of the white square plates,( something that is different to me) . I didn’t see the versatility of all the different additives of colors and arrangements that I could use with them until i looked at your website, Wow!!!! I can have so much fun. Thanks a bunch for sharing your creative flair. I love the look of using both style together! What a beautiful table! I have a wooden tool box like yours that my dad made me. It may be too large for my table but I love seeing how others style their home! I love them both….but the square is my favorite. Hoping to win…. have always used hand-me-down plates that have seen their better days (: I am having trouble registering for the drawing… hoping I figure it out. Love your page. Both are lovely, but I think I would choose the square just because I do not own any square dishes. Love white. It permits my decorating skills to run rampant. Beautiful! I’d definitely go for the square! I love the round set. Love the settings with both, but if I had to pick one, I would pick the round. I have been collecting vintage plates and I think they would look lovely layered on these! i love the square plates! And i am going outside to cut the last of the hydrangeas now before they are pruned next week. I am loving those square plates Kelly! Trish C. / Mama B.
I like both,but LOVE the square! And white just always looks amazing!!!!!!!!!! Love them both! Just lovely. I’m loving the square! It’s just a little different than a normal, everyday white plate, and would contrast with a lot of my existing (round) decor. Love this dishes. The color, shape and style are perfect. I’ve been drying hydrangeas like crazy! Love the square dishes. I own the round ones. We also own other white dishes because I love that ability to mix and match. Of course, that’s when I’m not using the vintage Luray we’ve found, or the vinrtage Fostoria given to us on our wedding day. We love having people over and setting a beautiful table for them to enjoy, as they enjoy their meal. I love both of these shapes; mixing is a great idea. have lots of antique dishes from rustic to crystal; these would mix right in. I like the square dishes. It is something different! The square plates are my favorite. I LOVE the round plates!!! White dishes are my faves!!! I love white dishes for the same reason…colors just stand out like on no other color and things always look new and exciting when used with them…Yes please enter me in the giveaway! Great ideas I actually have the round Filligree but would love to win the square ones to mix &match! At first I liked the round but now it’s the square! Both are really beautiful, thanks Kelly! I would go for the round ones; I’m pretty traditional, I guess. I love white dishes and these have such wonderful detail on them! I prefer round ones because I have some squares in another pattern! I followed your instructions for drying hydrangeas and they turned out beautifully! I love you site!!!! The dishes would be fabulous if I were the winner. I can imagine several beautiful holiday tables set for my family. And Hydrangeas are my favorite next to sunflowers. Good Luck Everyone and Best Wishes throughout the Holiday Season. The square is so unique! This is beautiful, Kelly!! I am loving the square plates too. Pinning! Those napkin rings are fantastic!! Love! !